The Black Sea looks crazy right now, as you can see in this photo taken by the MODIS instrument onboard NASA's Aqua satellite on July 15. These intense swirls are the work of a microorganism called coccolithophore, a "calcite-shedding phytoplankton [that] can color much of the Black Sea cyan." 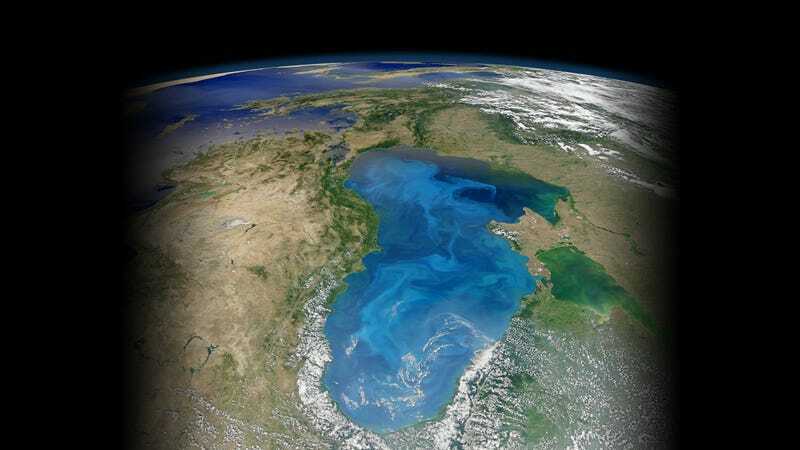 It's an impressive feat for such a tiny organism, as the Black Sea has a surface a 168,500 square miles (436,400 square kilometers). The Black Sea—which should be called Cyan Sea—is located between Eastern Europe and Western Asia, and it is connected to the Atlantic Ocean through the Aegean and Mediterranean seas.